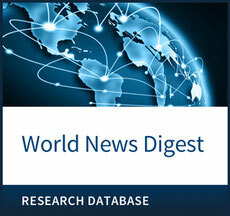 For more than 75 years, World News Digest has been a go-to resource for context and background on key issues and events in the news. Hundreds of news sources, governments, and organizations—including CNN, ABC News, CBS News, NBC News, Fox News, NPR, the CBC, Forbes Media, Time, The Washington Post, Jeopardy!, the U.S. Naval War College, and the parliaments of Canada and Australia—rely on World News Digest for a broader view of the issues that matter today. Information in context: In our age of information overload, World News Digest offers clear and cogent political, economic, and cultural stories that give a sense of time, place, and circumstance. - Overview: Read summaries of the major candidates, examining how their stances on key issues evolved over time. - Transition: Follow the transition from the Obama administration to the Trump administration, with coverage of the aftermath of the election. - Results: Review detailed statistics and electoral maps breaking down the presidential and congressional races. - Candidates: See what all the major candidates were up to on the campaign trail. - Positions on Issues: Check out where the candidates stood on critical issues. - Debates: Examine the key moments of each debate in the nominating process and the general election. - Educator tools, including advice on assessing students’ speeches, exploring point of view, preventing plagiarism, and using editorial cartoons and newspaper editorials in class.